An Escambia County woman ha been charged with a hit and run accident involving a Florida Highway Patrol vehicle. On September 5, a FHP Trooper H. Martinez was blocking Fairfield Drive due to a downed power line when his marked patrol vehicle was struck by a driver that fled the scene. Christine B. Stallworth, 26, was later identified as the driver of the vehicle after an investigation. Sunday, troopers attempted to serve a warrant at Stallworth’s home. She climbed into the attic and then entered the apartment next door where she was taken into custody. 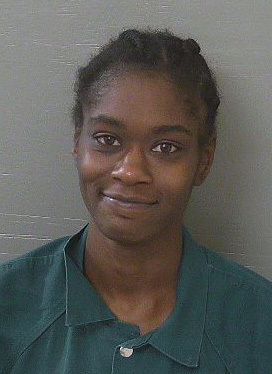 She was booked into the Escambia County Jail without bond on charges of felony hit and run, driving with a suspended license as a habitual offender and reckless driving.. She was also charged with felony burglary of an occupied dwelling and misdemeanor resisting arresting arrest without violence. Yep, looney as a tune. At least off the street for a little while. Will be back behind the wheel as soon as she’s released you can betcha on that. One of many who cause our auto insurance rates to be so high. Relieved the trooper wasn’t hurt. This is an example of what LEOs deal with daily. Just a funny game. Thank a Cop for their service. This chick is straight up crazy! girl you look so happy . keep on grinning you got it going on . too bad you are going to jail because you cant drive and you stupid!!!!!! but alls well that ends well !!!!! oh you going for a long time and not a moment to soon enjoy jail they wont let you drive there!!!!!!!!! She is happy she did it. Lets see if the Judge is also happy. She sure is smiling and seems happy about her current situation .If judges would start imposing more than just a slap on the wrist , I’d wager there’d be a lot less smirks like this on here .